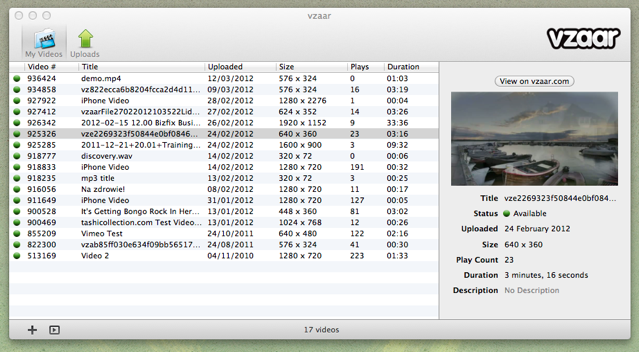 Uploading content to your vzaar account is now even easier with our desktop uploaders. Desktop uploaders are available for both Windows and Mac OS X. Users of OSX 10.9 and up can download the application from the App Store, or directly from vzaar. 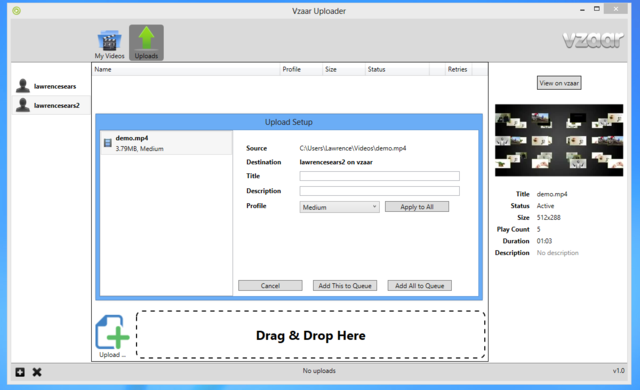 Windows users (XP and later) can download the Windows uploader directly from vzaar. When you launch the app for the first time, you will be be presented with a login screen similar to that of our website. Once you've logged in and given permission to the app, you will not need to go through that process again. 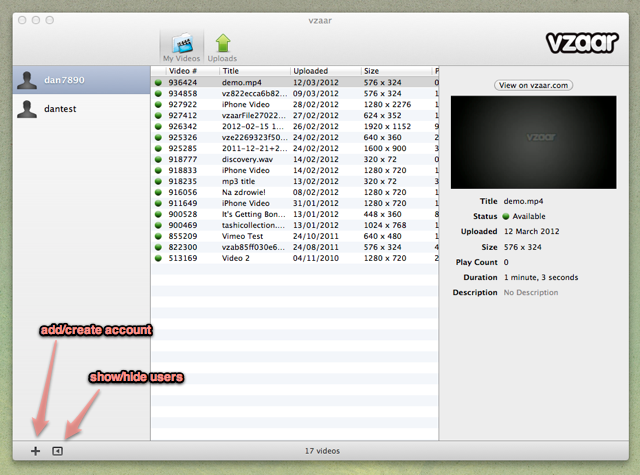 Once inside the app, you have two view: 'My Videos' and 'Uploads'. The 'My Videos' screen is a list of all your current videos within your vzaar account. You can view extra information about each video by clicking an item from the list. You also have the ability to delete videos from your account. Whilst you are on the 'My Videos' screen, simply select the video(s) you wish to remove, then hit the delete key on your keyboard. The 'Uploads' screen allows you to upload as many videos as you like. You can either drag and drop the files straight onto the application, or click the 'Upload' button at the bottom of the window to choose files from your hard drive. To select multiple files, hold down the cmd ⌘ key whilst clicking the videos. You can now choose a title, description and upload size for each video. 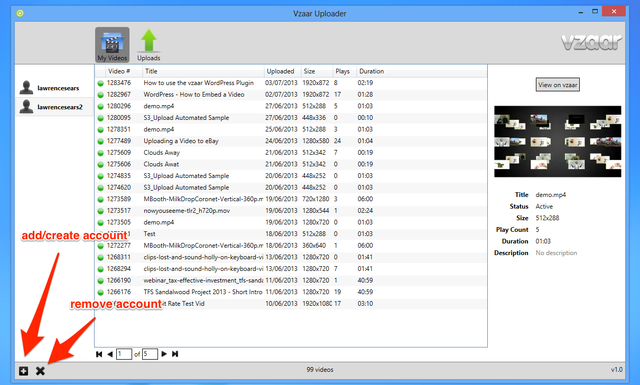 The vzaar desktop uploader makes it easy to manage content from multiple accounts. You can add or create a new account by clicking the + button in the lower left corner. In Mac OS X you can switch between the accounts by clicking the other icon to enable the sidebar. In Windows, the users sidebar is always open and the second icon removes previously added accounts. Whilst uploading in OS X, a handy progress bar will appear in the top right corner of your Mac's menu bar so you can keep an eye on your upload's status while working in other applications. Also, the Mac App's preferences (cmd ⌘ + ,) allow you to set your default upload size, and to customize the menu bar icon behaviour. Note: the desktop uploader does not currently support custom upload sizes.